One of the striking features of Earth (besides the living things upon it) is that it possesses a relatively large moon. While our Moon is not the largest in the solar system, it is large for such a small planet. The mass of the Moon is more than 1% that of Earth, compared to Jupiter’s largest moon Ganymede, which is just 0.008% of Jupiter’s mass. The origin of our large moon has been a matter of some debate. The most popular model is the collision model. In this model, the young proto-Earth collided with a Mars-sized planetoid sometimes named Theia. Part of the mass of Theia was captured to become Earth, and the remains formed a debris ring around Earth, much of which coalesced to form the Moon. This model has a lot going for it. 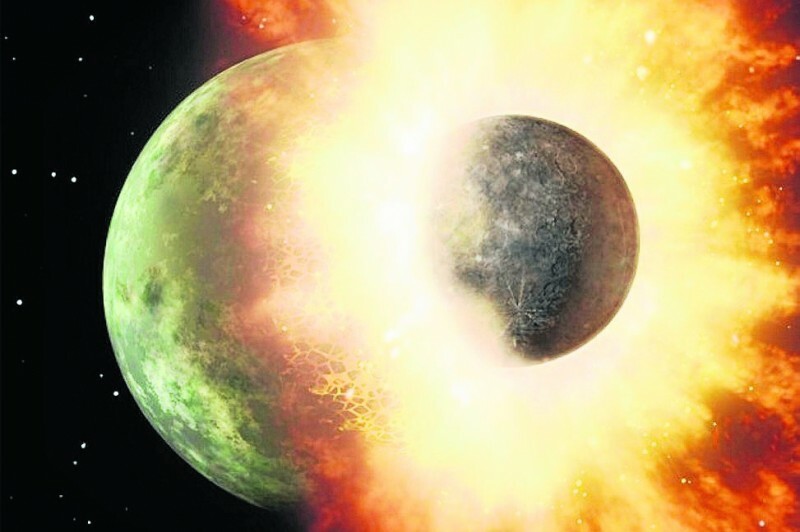 For example, the Moon has a density about 60% that of Earth, which is exactly what is predicted by the collision model, where the lighter outer layers of Theia and proto-Earth are scattered to the debris disk, while the heavy core of proto-Earth remains. The main downside of this model is the fact that the Earth and Moon have a very similar chemical composition. The only way to explain that fact with the collision model is to assume that Theia and Earth had a very similar composition, which would seem unlikely. Now new research published in Nature has found that similarities between colliding bodies aren’t as unlikely as we thought. The team ran computer simulations of young solar systems, and looked at how chemically similar large bodies were with their last major impactors. What they found was that 20% – 40% of the time they were similar enough to account for the Earth-Moon compositions. So it’s not so unusual that the Earth and Moon are chemically similar. There’s only one other body in the solar system with such a relatively large moon as ours, and that’s Pluto’s moon Charon. Charon’s mass is 12% that of Pluto. Charon is also thought to be the result of a collision, so when New Horizons makes its flyby of the planet in July, we find even more clues about planet-shattering collisions. It is claimed that the team looked at “how chemically similar large bodies were with their last major impactors”. For any object larger than Neptune, the impactor would be chemically similar only if it was a hydrogen-helium ball. So, is the discussion limited to collisions of rocks? The team was looking at the similarity between the last *major* impactors. Statistically they tend to have similar orbits and similar chemical compositions. Smaller impacts could be dramatically different. OK, well I read the abstract, and from that I have to infer that the study was concerned with collisions between rocky objects. Whether or not objects are “chemically similar” was determined in large part by content of an oxygen isotope. If we are concerned with collisions between hydrogen-helium gas or ice balls, we have to look at something else to determine whether or not they are chemically similar. Probably deuterium content. What is not clear is what was meant by “major” impactor. I presume it’s an object that exceeds some threshold weight fraction of the larger object. Is it possible that the collision was with a large comet? No, the colliding body would need to be about the size of Mars, and it would need to be similar to Earth in composition, so it was definitely not a comet.